Are you in need of REDCap support? 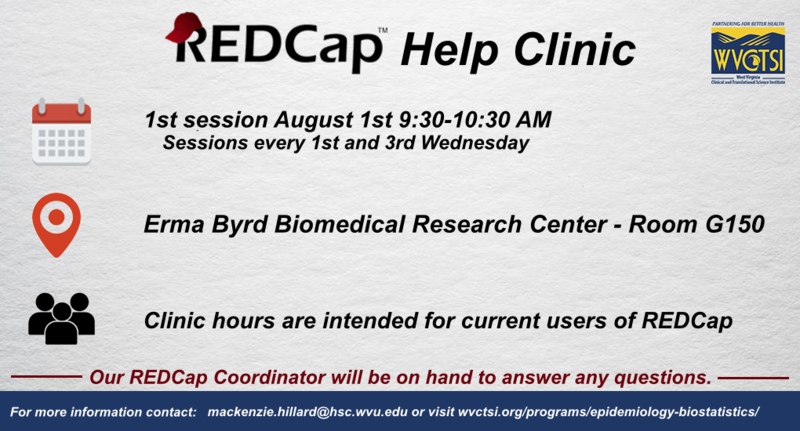 On August 1, WVCTSI will host its first REDCap Help Clinic to provide WVCTSI members with interactive assistance. During these sessions, participants can receive guidance and ask questions on a variety of REDCap topics including project initiation, features, functionality, and more. Starting August 1, help clinics will be held on the first and third Wednesday of every month from 9:30 to 10:30 a.m. in room G150 of the WVU Erma Byrd Biomedical Research Center. Stay tuned for information about future sessions that can be accessed remotely via videoconference. Questions regarding these sessions can be directed to Mackenzie Hilliard at mackenzie.hilliard@hsc.wvu.edu.